All registred in LetItPlay EOS holders will get up to 1000 PLAY tokens. We are building an audio future of The Internet. We believe that voice interfaces will drastically change the way we interact with devices and the way we consume content on the Internet. LetItPlay is a blockchain based ecosystem with attention economy that will help this Future come to pass. LetItPlay will economically motivate every website to create audio content for the new voice dimension of The Internet. What is airdrop for EOS holders? Airdrop is an opportunity to get free tokens. 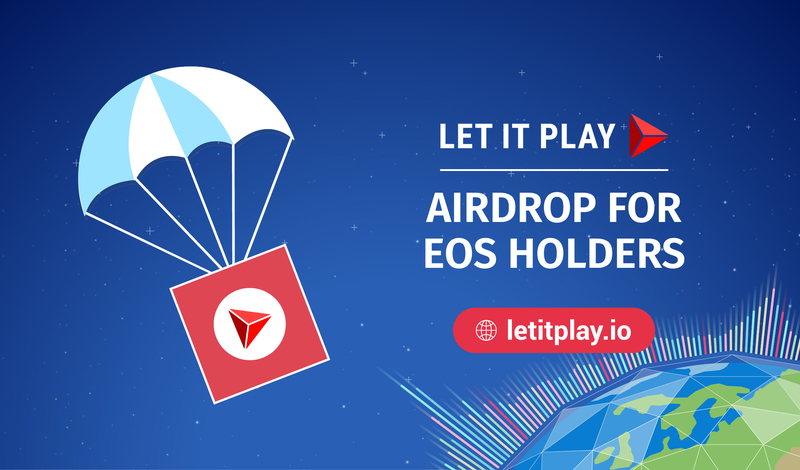 We decided to make an airdrop of PLAY tokens to EOS holders who will join our community. Why LetItPlay does the airdrop? We love EOS. LetItPlay project is being developed with EOS technologies and we believe that EOS ecosystem will become a steady fundament for LetItPlay. How to get free Play tokens? When is the PLAY airdrop? Any exchange support this airdrop? Je vous conseil un Super Wallet ERC20 !!! Made in Swiss !!! Oui Suisse !! No referer ! Info free ! nice project. no more restrictions when driving or having to take care of the children. no more neck pain because you constantly look at the screen. fewer accidents because the eyes can perceive the environment again. Hello admin. When will the snapshot be taking..
You got a 6.82% upvote from @brupvoter courtesy of @letitplay! Could i register using exodus wallet, or would i need to use MEW? If anyone reads this and has tokens at an Exodus wallet address, you CAN get your tokens out if you export the private key from Exodus. It's just not recommended and they make it somewhat difficult to find them to make sure it's deliberate on your part. Go to their website support if you need to do that. This post has received a 0.51 % upvote from @boomerang. You got a 1.20% upvote from @upmewhale courtesy of @letitplay! J ai visiter les 2 sites !! Me suis meme inscris a 1 , mais je ne vois pas AirDrop ????? Congratulations, your post received 3.82% up vote form @spydo courtesy of @letitplay! I hope, my gratitude will help you getting more visibility. Do you get airdrops if your coins on binance? but i dont have EOS,how can i still participate? hi admin! I must have at least 1 EOS in my MEW then were I allowed to participate in the airdrop? If I only participate in soccial campaign, is it allowed? Hey nice to hear from u. What do u think about cryptonote and BCN?